Most bass fishermen are well aware of George Perry's world record largemouth bass. His massive bass is coveted as the most elusive and sought after freshwater fishing record amongst anglers for decades. There have been many attempts at the world record largemouth bass. Some have come extremely close. Many have faltered. Many are very noteworthy. 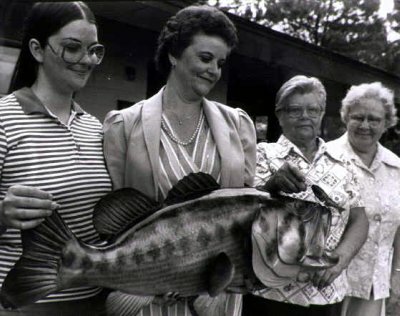 Including the end of an era of the famous "Dottie" from the devoted anglers of Mac Weakley, Jed Dickerson, and Mike Winn, in hopes of landing her heavy enough to be a new record largemouth bass. Or the current gunner for the world record bass of Manabu Kurita from Japan with a tie, although his monster catch weighs about an ounce more. As with any attempt, there comes the controversy that surrounds it. Some don't even fully agree with the record bass of George Perry. If that's the case, the next big bass in line of the record books would still stir up the same type of criticism and controversy. Until then, the legendary reign of George Perry will continue in the record books. Even so, his world record largemouth bass will surely stay in the hall of fame. George Washington Perry was a 20 year old farmer in Telfair County, Georgia. On June 2, 1932, his fields were too wet to plow, so he and his fishing buddy set out to Montgomery Lake to do some fishing. 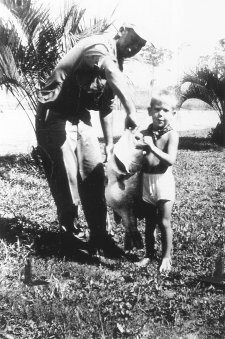 Little did he know, that day would set him into legendary status with the world record largemouth bass. He cast out his fishing lure and felt a strike. He pulled back to set the hook and felt a lot of pressure. He thought the fish may have bulldogged him into some cover and got him hung up. So he thought he lost the fish. However, he managed to reel in a behemoth largemouth bass... THE Largemouth Bass - 22 pounds, 4 ounces! What did he do with it? First, he entered it into the Field & Stream magazine bass contest. And of course he won the contest. He received a $75 prize package which included a rod, reel and a new shotgun. Did he release the fish then? Nope. He was a poor farmer in the depression era and wanted to put some meat on the table. That's right. He ate it. There have been speculations as to what tackle he used to catch the fish. On a voice recorder taped from an interview he had, he says that he used a Creek Chub Fintail Shiner, which was the only lure that he owned. When he thought he was hung up, he was afraid that he may have lost his only lure. He matched his lure up with a True Temper rod and a Pflueger reel. 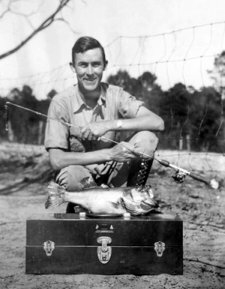 George Perry's bucketmouth was certified by Field & Stream and soon later classified as the world record largemouth bass. Bill Baab helped authenticate the snapshot you see to the left. 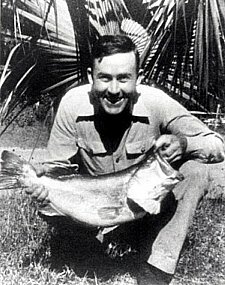 The man smoking the cigarette in the photo is said to be his fishing partner from that day, Jack Page. The photo was presented from a relative of Perry's. And it is believed that there were other pictures taken of George with the world record largemouth. He supposedly had sent one to Creek Chub in an effort to receive a compensation from them. However, they have no recollection of ever receiving such a photo. So whatever happened to these mysterious photos? Hopefully they will soon surface one day. What happened to George Perry? He enjoyed flying planes and was a self taught certified pilot. In 1974, his plane crashed and he died at the tender age of 61 years. Although he has passed on, he truly has left a legendary mark with us, and will always be known to have reigned as the world record largemouth bass holder. Pauline Perry (George's widow); Rubye Perry Latham (George's sister). Photo by Bill Baab, 1983.